Maybe it was the fact that the mere act of taking those photos could have had me shot on sight back in the Cold War days. Was that a government agent behind that eucalypt tree with binoculars trained on my every move, or maybe a Russian spy lurking in the shadows with a tiny camera and wearing a black suit and sunglasses? Will James Bond arrive at any second in his silver Aston Martin, ready to save the world from imminent destruction? Just my imagination of course, but Woomera today is one of those eerie, largely deserted places that smacks of a 1950s secret base. And that’s exactly what is was and still remains. Most Australians know nothing about Woomera’s amazing story which saw it as the centre of Australian and British space race projects. However 65,000 tourist call in each year which keeps the town ticking along. Rockets still blast into space from Woomera and if you settle in for cleansing ale at the local pub you will soon meet up with an international group or two who are involved in some mysterious project. Located 446km north of Adelaide, Woomera is just off the Stuart Highway and is well worth spending a couple of days’ visiting. I checked in at the Eldo Hotel which offers 400 beds in a varying range of formats. The hotel reception, including the Oasis bar and restaurant, is located in the former Eldo administration facility. The blocks have names such as “Redstone”, “Black Knight”, “Blue Steel” and “Skylark” – all former rocket or missile systems once tested at Woomera. The Traveller’s Village Caravan Park is a privately operated venture centered around the old Senior Ranks Mess facility. Woomera was established in 1947 and was a secret base for Anglo-Australia rocket and weapons testing for many years. It is still considered one of the best testing and launch facilities in the western world. The Woomera area includes the RAAF Woomera Range Complex, a large Australian Defence Force aerospace and systems testing range covering an area of 120,000sq km. The 2016 census states that Woomera has a permanent population of 146 people, but back in its heyday at the height of the Cold War, 7000 people lived in the area. Today’s Woomera village contains deserted suburban streets of modern houses where no-one lives. There are community halls and churches that are largely forgotten. It appears as though the people just walked out and suddenly left, disappearing into the desert. There are 27 pastoral stations within the Woomera Prohibited Area, which essentially forms the ground space of the Woomera Test Range. Four major mines Challenger, Prominent Hill, Peculiar Knob and Cairn Hill have been established in the area. By the end of the 1960s the Anglo-Australian Joint Project was rapidly winding down following the UK Government’s reduction in further experimental work. Since 1982, the general public has been able to visit and stay at Woomera. However, only Australian Government (mostly Department of Defence) personnel and contractors to the Commonwealth are able to live at Woomera on a permanent basis. 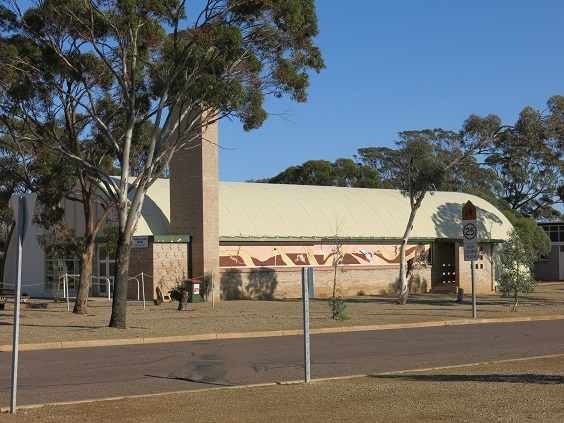 Public access to the facilities and services of Woomera, including several museums located in this historic site, is permitted year round. The RAAF has gradually assumed full control of the entire facility. Tourists are able to view the National Missile Park in the centre of the village. It features an excellent display of rare aircraft, rockets, bombs and missiles covering the full period of the Range’s operations. The nearby Community Museum maintained by the village’s volunteer community board is located within the missile park precinct. There are no privately owned homes in the village although some are leased to agencies such as the Bureau of Meteorology. The facilities in the village include a gym, hotel, swimming pool, hospital, cinema, school, two museums and missile park. 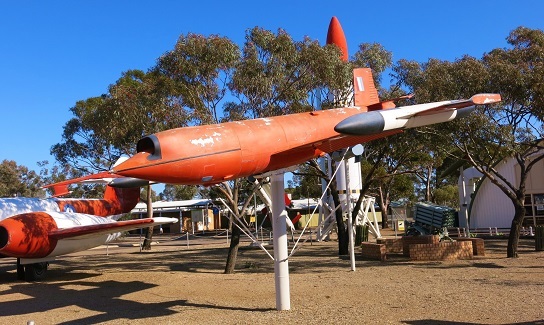 The Woomera Heritage Centre, which was the former recreation centre for USAF personnel and their families, features a modern interactive display and interpretive centre covering the full life of the Range, a souvenir shop, and a significant display of regional history. It also features the story of the legendary Len Beadell, the famous surveyor who laid out the original range across vast tracts of the Australian Outback stretching from Woomera to the North-West coast of Western Australia. So, if you are motoring along the Stuart, don’t just call in briefly and to Woomera and then keep going. Stop awhile and spend some time viewing the displays and talking to the locals. I guarantee you will enjoy it.